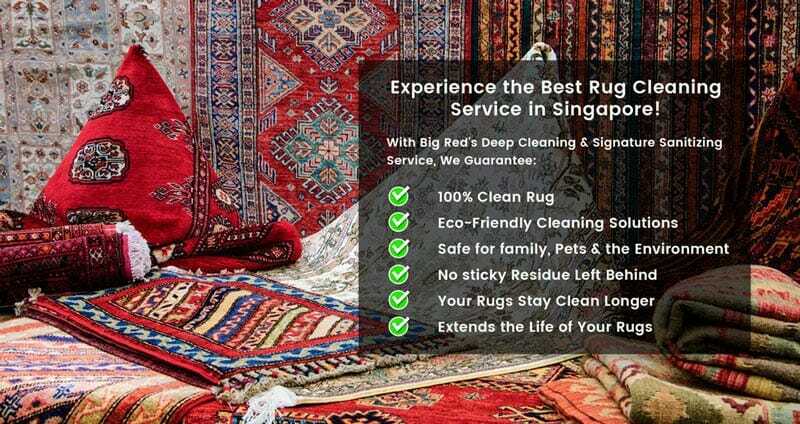 Big Red is your one-stop solution for rug cleaning Singapore services. Area rug adds warmth and beauty to any home. The difference between a carpet and a rug – a carpet is attached to the floor, just like wall-to-wall carpeting, and a rug is used as an accent piece. Rugs can be handmade, contemporary or antique. 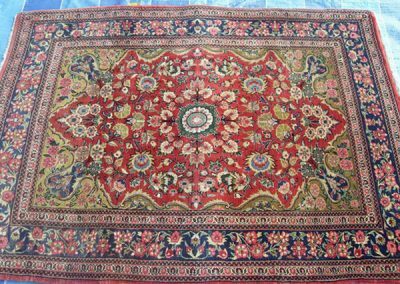 Big Red specializes in professional area rug cleaning services including: Persian, Pakistani, Afghani, Chinese, Indian, Antique, Silk and hand made. 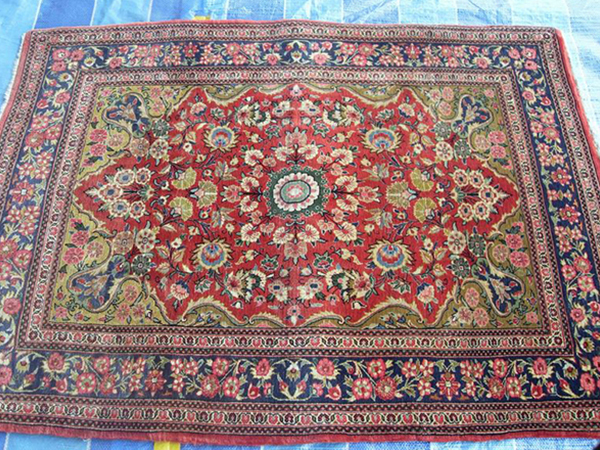 Taking proper care to preserve your Oriental rugs is vital regardless of where they are made from. We believe in protecting your investment and stopping the damage before it starts. We strive to provide each client with a superior personalized level of service, tailored to their convenience with an affordable policy for all of our services to give our clients the best deal. Each rug requires its own special care. Prices will vary depending on the type of rug, the rug fibers and the amount of cleaning required. In order to make the best possible evaluation of the price of cleaning your rug, we would advise you to call us, email us or just click on the link below and attach an image of the rug you want cleaned. Prices will vary for the professional cleaning of antique rugs and kilims (i.e., those pieces over 100 years old) due the quality and condition of these pieces. We will provide cleaning quotes for antique pieces upon personal inspection. 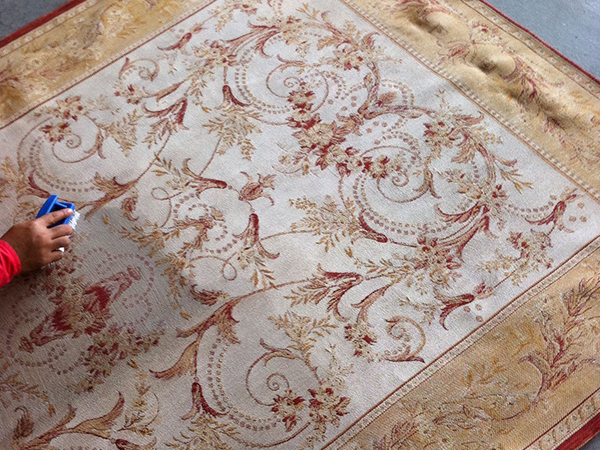 At Big Red, rugs are treated individually with special attention, care and proper cleaning. At our state-of-the-art cleaning facility, we determine the best cleaning technique and method that suits your rug’s particular weave, fibers and dyes. We ensure your satisfaction with the best results that will extend the life of your rug and protect your investment. Our technicians use cutting edge technology processes in order to deep clean and revive the colors of your rug. The dirt, grit, sand and soil trapped in the rug’s nap and foundation act as an abrasive. Cleaning enhances the value and appearance of a rug and increases its longevity. Rug cleaning adds to the life of the rug. You only need to order and accept the delivery of your freshly cleaned rugs. We worry about the rest. Within 10 to 14 working days, we deliver your rugs looking better, smelling better and free of dirt, dust, soil, pollutants and allergens. Send us a picture so that we can identify the fibres of your rugs and advise you on the best cleaning methods we will use. Before we inspect and collect your rugs, we will let you know exactly what preparatory steps to take before we arrive at your premises. You can inform us if you have any special requests like particular areas to concentrate on, a preferred method of cleaning, etc. We treat your rugs very carefully from the moment we collect it. No 2 rugs are the same – they are made of different fibres, have seen different levels of foot traffic and are used for different purposes. In addition, each rug-owner may have their own preferred methods of cleaning, not to mention different budgets. The whole cleaning process will take about 10 to 14 working days to complete. Then we’re ready to deliver it to you. We deliver your newly cleaned rugs back to your premises on your schedule, at your convenience. What makes Big Red different from other cleaning companies? The 2 biggest differences are that we sincerely care and we really have the best expertise in cleaning all sorts of rugs since 1986. We care about the people we hire, the products and cleaning processes we use, our customers, their living environments and their rugs. Big Red is internationally certified by several authorities and institutions, including the Carpet and Rug Institute (CRI) and the Institute of Inspection Cleaning and Restoration Certification (IICRC). Big Red’s rug technicians are highly trained and have a passion for top-notch customer service. Big Red has access to sophisticated and state-of-the-art equipment as well as environmentally friendly cleaning solutions to get the dirt and grit out from deep inside your rugs. We can also provide a protective coating for your rug fibres which prevents grit and soil from damaging them. What method of cleaning does Big Red use to clean the rugs? Big Red always ensures that the method of cleaning used is best suited to your rug fibers, the unique conditions of your residential or commercial premises and the health of its occupants. We first use a Pile Lifter which helps to groom the nap of the rug to allow the cleaning solution to reach deep into the roots of the rug fibres for a thorough wash.
We use a hot water extraction system to flush water into your fibres. Then its powerful suction extracts all the residual cleaning solutions, contaminants and other dirt from deep within to leave your rug clean, chemical-free and looking and smelling great. What does Big Red do when you enter my premises? We take the time to inspect your requested cleaning areas and go over our process to getting your rug looking great again. We identify the rug fibre, sensitivity, density, in addition to assessing your needs, health concerns and the unique foot traffic of your premises to advise you on the best course of action to take to clean your rugs thoroughly. We seek to answer all of your queries and meet of all of your requirements as best as we can. And whenever we are at your premises, whether we are cleaning your rugs, picking them up or delivering and installing them, we treat it like our very own. Does Big Red provide cheap or affordable rug cleaning? Our prices are always fair, reasonable and honest. 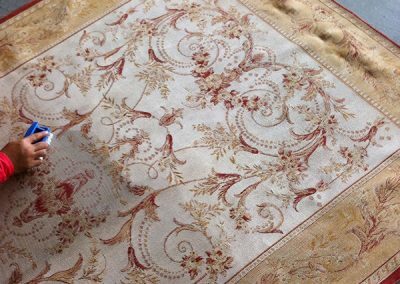 We are not the cheapest option in the market and would sincerely advise you to treat cheap quotes for your rug cleaning with the utmost caution. Do not fall prey to bait-and-switch tactics – a low offer or quote is made just to get into your premises, then once there, high-pressure sales tactics or numerous add-ons are inserted into the invoice to charge you extra. We charge a flat, per square foot rug cleaning fee. Our price points are stated and adhered to. We always tell you what the price is upfront so that there are no surprises at the end of the job. We care and will treat your home and office like it’s our own. How long will it take for my rug to dry? The time it takes for your rug to dry up is dependent on the rug fibre type, its pile and density, the temperature, humidity and air flow to the area cleaned. The use of air movers and switching on the air con can accelerate the drying time. Big Red ensures that up to 95% of all moisture is removed from your rugs once we are done cleaning your rugs. Our rug cleaning technicians always leave the rug as dry as possible using modern and efficient machines. Your rugs should be completely dry within 1 to 3 hours (for some thicker weave rugs and thicker designs, drying may take longer) and you’ll be able to walk on them again in no time. Do you guarantee removal of all spots and stains in the rug? While we can guarantee the removal of spots, we cannot guarantee the complete removal of all stains. Some spills can permanently discolour the rug fibres. 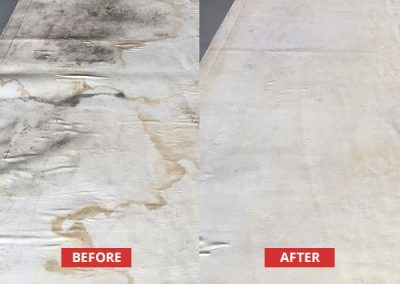 The type of fibre, how old the rug is and any prior attempt to remove the stain with harsh or reactive chemicals are all also possible elements that can affect the success of the Big Red Stain Removal process. That is why we cannot provide you with a guarantee. What we can guarantee is that we will use our expertise and the very best available technology. We have many years of combined on site experience and know how to clean stains off of many different rugs and fabric types. We are able to employ unique strategies to get the best results. But we can’t give an unequivocal yes. Will vacuuming my rugs regularly be sufficient to keep them clean? Vacuuming is sufficient for day-to-day care only on a short-term basis and only for the surface of your rugs. Dirt, dust, soil and other particles still remain deep within your rug. There are some things that are left behind after you vacuum flea eggs, bed bugs and pet dander, which may aggravate allergies and asthma if they are not removed regularly. These can only be removed by professional rug cleaners who have the equipment and the know-how to get your rug truly clean deep into the rug fibers. Yes! We use only non-toxic rug cleaning products that are 100% safe for your rug fibres and for you (and your pets, too). Do you clean office rugs? Do you offer commercial and industrial rug cleaning? Big Red is highly experienced in cleaning industrial and commercial premises. We have over 30 years’ experience cleaning rugs in offices, hotels, hospitals, schools, boats, airplanes and factories. With our experience, we know which cleaning methods work best in which environment. Even better, we know exactly what kind and levels of cleaning our customers want. Do you provide rug protectors? Yes, we do. Our special Red Shield Rug Protector is designed to ensure protection from liquid spills. Rug fibres normally absorb liquid spills almost immediately. The liquid seeps into the rug and goes deep into the fibres, making it difficult to remove such liquid materials. With the Red Shield Rug Protector, liquid spills will momentarily float on the surface of the fibres, giving you ample time to get an absorbent cloth to wipe up the spill before it damages your rug. This protector should be re-applied once a year for the best results. Some rugs may be prone to shrinkage after cleaning with water. After over thirty years’ experience, we can spot the fibers within a rug which may cause this. Once spotted, we take the appropriate preventive measures to ensure that the risk of shrinkage is kept to a minimum. How often should my rug be cleaned by professionals? For homes, rug manufacturers recommend getting a professional cleaning at least every 6 to 12 months. If you have bad allergies, you should call us three to four times a year. We remove the irritants, allergens and contaminants embedded in your rug, making the air cleaner and fresher. 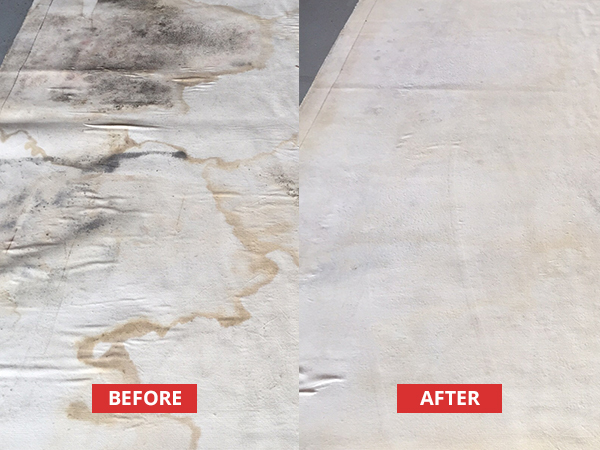 For offices, retail and commercial premises, we would recommend professional rug cleaning once every 3 to 12 months. In all cases, the frequency of cleaning will be highly dependent upon how much foot traffic there is, and whether the traffic is heavy and transfers soil onto the rug frequently. Does cleaning my rugs regularly make them dirtier? This is true only if the rug cleaning is done incorrectly. 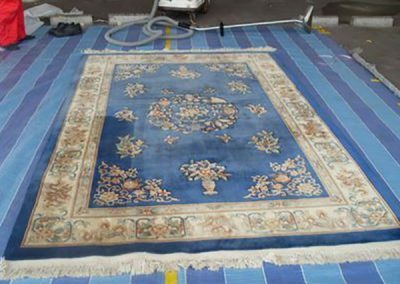 It is very important during the rug cleaning process that the chemicals used to clean are rinsed and extracted thoroughly during the cleaning process. If done incorrectly, the chemical residue will act as a magnet and attract dirt rapidly. When you choose Big Red Rug Cleaners, you can rest assured that this will not be the case. Our specially formulated rug cleaning solutions and professional steam extraction processes ensure that all of the chemicals and the dirt are extracted from the deepest part of your rug fibres, leaving your rugs chemical and dirt free. Our 30-Day Big Red Clean Rug Guarantee!